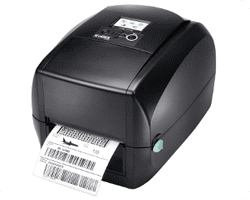 The GoDEX RT700i is a powerful desktop barcode label printer fully equipped with several user-friendly interfaces. The RT700i comes loaded with a Color LCD, standard Ethernet, USB 2.0, Serial and USB Host Ports. The RT700i has been completely redesigned with a clamshell design, calibration button to facilitate media swapping and a large 300 meter ribbon capacity. In the box, customers get free GoLabel Design Software equipped with basic database integration. The RT700i is perfect for retail and industrial applications and it comes with our industry leading printer warranty.